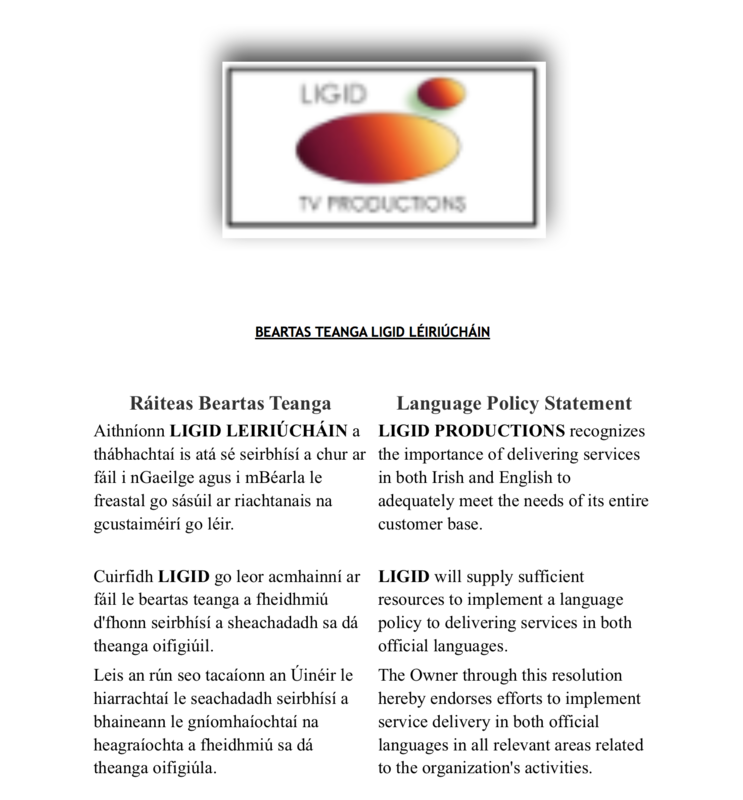 LIGID Léiriúcháin is a company with over 20 years of experience, working at a very high standard and across a wide gamut of genres. LIGID specialises in Factual & Drama documentaries telling the story of people in the recent past through first person interviews and drama representations of events. LIGID Léiriúcháin has won numerous awards in the Prix Circom international documentary section, is a Celtic Film Festival nominee and an Amnesty International Human rights Worldwide TV Award winner. LIGID Léiriúcháin is a highly creative, innovative, multiplatform company that has worked with RTÉ, BBC, TG4, Discovery and the ARTE Networks over the past 20 years. Tá cáil ag LIGID Léiriúcháin ar son cláracha crúthaitheach, taitneamhach, dúshlánach agus daonna a léiriú. Tá sonraí faoi na cláracha atá léirithe againn go dtí seo ar an chéad leathanach eile. Más rud é go bhfuil suim agat a bheith páirteach sna cláracha atá á léíriú againn amach anseo, nó má tá ceist agat dúinn té i dteagmháil linn. I 1977, tháinig bád darbh ainm ‘Cara na Mara’ isteach ar an trá i Machaire Chlochair, Gaoth Dobhair. Bád mór iascaireachta a bhí ann agus tugadh isteach í le cóiriú mar go raibh cúpla planc briste uirthi. Cas ar aghaidh go dtí 2017 agus tá an bád ansin go fóill agus tá aithne níos fhearr uirthi anois mar ‘Bád Eddie’. Idir an dá linn, bhí sí le feiceáil san fhíseán ceoil “In a lifetime” de chuid Clannad/Bono, bhí sí ar leathanaigh iris VOGUE agus glacfadh na mílte pictiúr di. Ach do dhaoine óga an cheantair sna 70í ba shuíomh súgartha í, áit ina raibh siad abálta bheith ina bhfoghlaithe mara ar bord a long féin. Seo scéal ‘Bád Eddie'. In 1977 the boat ‘Cara na Mara’ was towed into Magheraclogher Beach in Gweedore, Co Donegal. She was a large fishing boat and was on the beach as she needed two planks repaired. Fast forward to 2017 and the boat is still sitting on the beach, better known now as ‘Bád Eddie’. This is ‘Bád Eddie’s’ story. Bhí mé ann is a unique landmark EU PEACE III funded documentary series that recounts the stories of those who tried to live ordinary everyday lives throughout the conflict in the North. Parents, Children, Husbands, Wives, Teachers, Firemen, Nurse’s and Soldiers people from all walks of life yet they have one thing in common – Bhí mé ann (I was there). People from all sides of the community have stories to tell. This series for the first time gives a unique insight into the lives of ordinary people surviving through extraordinary times. ‘Bhí mé ann’ is a series which came from the Glórtha Aduaidh project and is supported by the European Union’s PEACE III Programme, and managed for the Special EU Programmes Body by Pobal. ‘Bhí mé ann’ is a LIGID TV Production in conjunction with WestBIC and in association with TG4 and RTÉ. Is sraith nua sé chlár í Bhí mé ann, atá maoinithe ag SÍOCHÁN III de chuid an AE. Díreoidh an tsraith Ghaeilge seo ar an saol a chaith na gnáth dhaoine le linn an choimhlint i dTuaisceart Éireann. Pléifear don chéad uair, scéaltaí agus cuimhní cinn na ghnáth dhaoine a mhair fríd an tréimhse cunspóideach seo. AMNESTY INTERNATIONAL HUMAN RIGHTS WORLDWIDE - TV AWARD 1998. Amnesty International Human rights Worldwide August 1998 the documentary "I gCillín an Bhais" was selected / awarded by amnesty international worldwide for screening as part of their 50th anniversary celebrations in brussels, belguim. A thirty minute documentary focusing on the story of the hiring fairs in the North West of Ireland, where parents had to sell their children from the age of six to twelve. The story is told exclusively by those who fell victim to these times. An exclusive one hour feature documentary telling the history of Long Kesh Prison from it’s opening in 1971 to its historic closure in September 2000 through the experiences of both Republican and Loyalist prisoners. Is sraith nua ceithre chlár é Daltaí an Chaisleáin ó BBC Gaeilge, a dhíríonn ar na daoine a ndearna a dtiomantas scoil nua-aoiseach de chaisleán meán-aoiseach, ar na constaicí a bhí le sárú acu agus atá le sárú acu go fóill agus an scoil ag méadú faoi dhó, ó 16 dalta nuair a osclaíodh an scoil i Meán Fómhair 2015, go dtí 32 i Meán Fómhair 2016. Is é Ligid Léiriúcháin a rinne Daltaí an Chaisleáin do BBC Gaeilge, le maoiniú ó Chiste Craoltóireachta Gaeilge Scáileán Thuaisceart Éireann. Cuir scéala chugainn - Drop us a line ! We love hearing your feedback, comments, stories, experiences, so feel free to visit during normal business hours. Copyright © 2019 LIGID Léiriúcháin - All Rights Reserved.